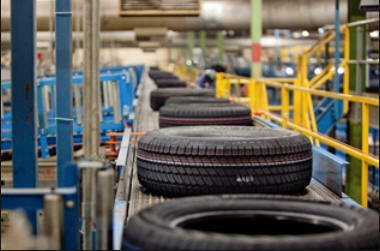 When an American highly automated tire production plant wanted to replace their aging one-way paging system to alert maintenance technicians to a breakdown in the production chain which required an immediate repair they turned to Datalink and a local Kenwood LMR Dealer to provide a solution. The Plant Management selected Kenwood NEXEDGE Portable Radios for voice communications and a Datalink text messaging solution based on Datalink's well proven DataNET software management programs. Typically when a PLC (Programmable Logic Controller) monitoring automated processes detects a fault, the PLC sends a status signal to a systems monitoring console. The console operator will assess the problem and will send a service alert to one of a number of plant service technicians with the required training for the particular fault. The alert service call details are entered into the Datalink software program which is then transmitted over the NEXEDGE network to the appropriate technician for immediate repair action. The details appear on the portable radio's text screen. The time/date stamped details are also stored in the maintenance department's data-base. All status reports entered by the technician at the fault location into the radio using status keys are transmitted back to the systems monitoring control console and automatically recorded in the Datalink program.